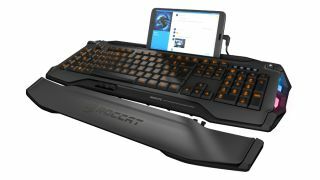 Roccat has announced the launch of a new RGB gaming keyboard which has been some time in the making (it was first teased a couple of years back), and tries something different by fully integrating mobile devices, be they iOS or Android, via a docking slot. Said dock runs along the top of the Roccat Skeltr, and it allows the user to slot in more or less any smartphone or tablet on the market – all devices should fit, and you can situate them either horizontally or vertically, with the docking process not involving any kind of clips or other bits of flimsy plastic which might break. Once your mobile is in place, you can press a simple key to switch between typing on your computer and your device (the latter being linked to via Bluetooth). So, if you're busy on your PC but you see a message come in on your phone, you can tap the key, fire off a quick reply to the text using the Skeltr keyboard, then switch back to working on your computer. Companion phone apps can potentially bring a new dimension to your PC games, and you can also connect a headset to the keyboard and take calls from your mobile using it. As for the peripheral itself, it boasts what the company calls "optimized membrane keys" to offer a solid level of typing precision (no switches here, in other words, sadly), and you get six macro keys that you can program to whatever you wish. It also offers a detachable wrist rest, and the Roccat Swarm software lets you configure the RGB lighting with various different effects available, as well as doing stuff like quick launching games, and even checking temperatures within your PC to see if the processor or graphics card is running too hot.